Where it happened: Wreckage lies under the much-scarred railroad trestle on First Avenue. 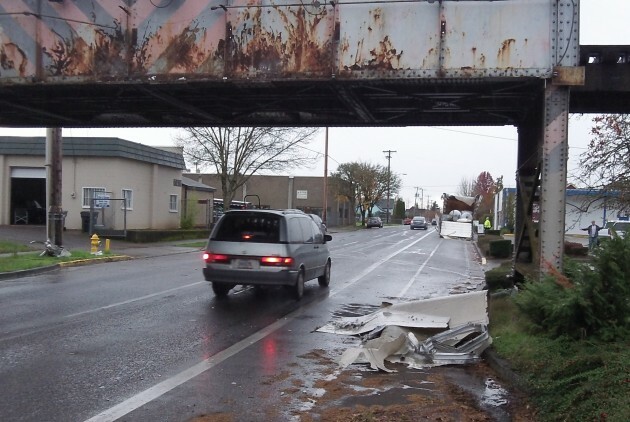 Albany’s truck-eating overpass did it again this afternoon, illustrating yet another shortcoming of relying for driving directions on GPS. A driver unfamiliar with Albany was delivering bags of packaging material — those infernal plastic peanuts — and had a couple of addresses to go when his GPS told him to take First Avenue. What the GPS system did not know or did not tell him was that this was not the best route in this particular case, considering that his truck was about 13 feet tall and the clearance under the Lafayette Street railroad trestle is 11 feet 4 inches. The driver, a young man who preferred not to give me his name because he didn’t want to embarrass his employer, told me he’s from Brookings and was driving for a company out of Eugene. I said I hoped he wasn’t hurt. No, he said, just pissed. The trestle has been chomping tall trucks for seemingly forever. At one time the city lowered the deck of First Avenue to make collisions less likely. A detour was established for trucks. Overhead chains were dangled across the street with the hope that their jangling across the roof of tall trucks could alert drivers to an imminent crash. 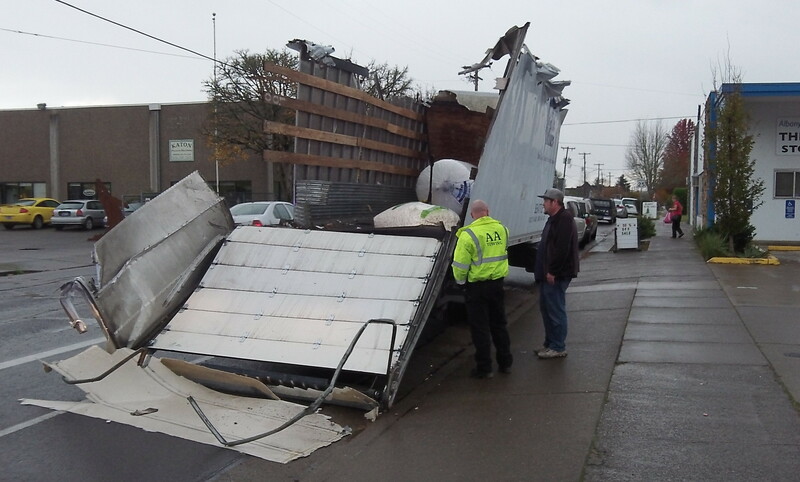 And yet, now and then, the occasional truck still gets ripped open. The railroad tracks cannot be raised. Maybe the street underneath could be lowered some more, even though it already has a substantial dip. Maybe nothing more can be done, except this: Urge GPS systems available to the public to call attention to this particular trap on an Albany street. In 1973 I persuaded the City Council to install the chains. Im told they do some good but don’t work in all cases. In 1972 on a hot summer day, working on a construction project in North Albany pouring concrete, our crew waited for the day’s final truckload which was long overdue. Having been assured by the Morse Bros. dispatcher that the truck had left their plant some time before, I was sent to look for it. I found it….stuck under the trestle with the drum split open like a cracked egg and about 5 yards of rapidly setting concrete surrounding it on the street. Needless to say, the truck’s driver lost his job that day. Maybe we could make it a National Historic Site? Don’t blame the GPS. The fault lies with humans. Until we, all of us, start driving beyond the front of our vehicles and concentrate on driving, these kinds of things will continue to happen. We get in our vehicle and immediately go into our “Zone” and seem to loose all our senses. Distractions inside the vehicle, every day concerns and worries all have an effect. We live on a street marked “NO EXIT” but get vehicles that turn in, drive to the end, become irate, then have to back out. For the record – my Garmin GPS in “Recreational Vehicle” mode does warn of this underpass with both a symbol on the map and an audible warning sound if you get close to it – and routes you around it before you ever get that close….